Here's my latest project, hanging vases. I wanted to display just a few flowers at a time and this is working out pretty well. First, I spotted the test tubes at Tokyu Hands (I'm starting to sound like an advertisement for them) and thought, those are cool, but what do you do with them? A couple of weeks later, I spotted a really cool hanging vase made from ... you guessed it, test tubes! So I went back to Tokyu Hands, which is sort of like the Michaels of Japan, and bought 3 test tubes. I thought they were quite the bargain at 73 yen each! To get them to hang, I cut out little squares out of cardboard (about 1.5" square for a medium size test tube). Then I put the rim of the test tube in the center of the cardboard squares and traced a circle. Then, this is not so scientific, I used a blade knife to cut just inside the circle. You want the opening to be big enough to slide the tube through, but smaller than the rim so it doesn't fall through. Next I used decoupage glue (like Mod Podge) and little scraps of decorative paper to cover the cardboard. Finish with another coat of the glue over the papers. 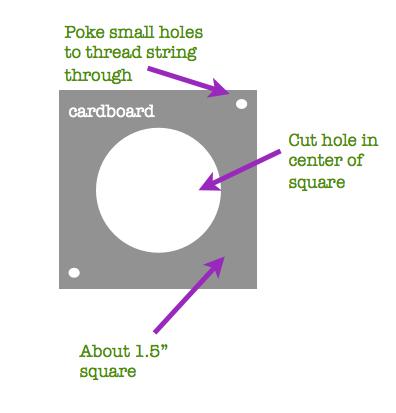 While the glue is still wet, poke small holes in two corners of the square (see image). String through fishing wire and double knot underneath the cardboard to hold in place. I did a three tiered test tube vase. Tie the knots under each new cardboard holder to keep in place. Now you can make just a few cut flowers or even leaves from your balcony garden or yard look great! Thank you (and your cousin) so much! my fav. 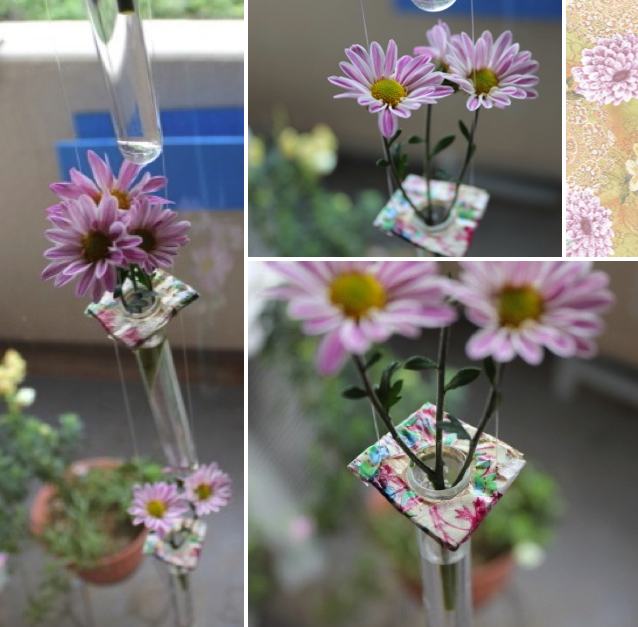 flower holder right now is something like this (however i bought it last year at canadian garden show) its 5 test tubes attached to a thin steal cable (hangs down) and each test tube sits in steal collers that are crimped to the cable so this makes removing the tubes for washing or filling easy. its such a fun look.